Whether the task is commercial, residential, or even municipal, Rowe Tree Service can manage the job. Roweâ€™s has enhanced the area in and around Stockbridge, Georgia for almost twenty years, and customers continue to call back. We are fully certified and insured, with documentation available upon request. As a long-standing member of the International Society or Agriculture, the standards of the work executed is consistently beyond the minimum professional requirements. 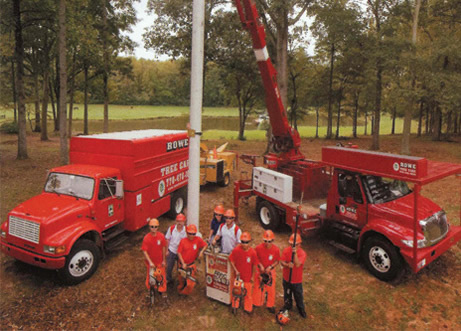 Rowe’s arborists are trained in the latest techniques and methods within the Tree service industry. Roweâ€™s is the only name that matters for your tree needs. Trimming, shaping, and pruning can serve two purposes: hazard reduction and maintenance. Hazard reduction can get rid of branches that might compromise the structural integrity of the tree; maintenance can make your tree more aesthetically pleasing. We offer both services, in order to keep your trees healthy and attractive. There is no task too small or too large for us to handle.